The Granada War Relocation Center, better known as Amache, was listed on the National Register of Historic Places in 1994 and designated a National Historic Landmark in 2006. Located near the Town of Granada in southeastern Colorado, Amache is a nationally significant, outstanding example of a WWII relocation center. Amache opened in August 1942 and remained open throughout the duration of WWII until 1945. At its peak, the camp housed 7,318 persons. 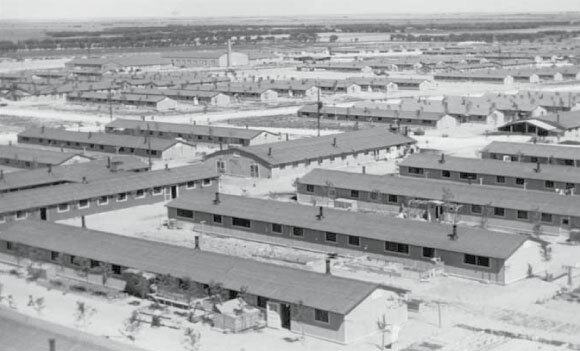 The camp was one of ten in the nation created by President Franklin D. Roosevelt’s administration under the authority of Executive Order 9066, which followed the Japanese attack on Pearl Harbor, Hawaii on December 7, 1941. The Executive Order incarcerated Japanese-Americans during World War II following their forced removal by military authorities from the West Coast. This action was justified as “military necessity” and greatly influenced by racist sentiment and wartime hysteria, compounded by intense fear of Japanese terrorist attacks or espionage against the United States. Amache, however, was particularly known for its ability to avoid the characteristic conflict and violence that many other centers had. Amache’s period of significance extends from 1942, when the War Relocation Authority selected the site as a relocation center, to 1947 when the War Assets Administration disposed of, mainly off-site, the last of its buildings. Amache today is underutilized despite its exemplary historic national significance. The site exists today as it did when the War Relocation Authority selected the site in 1942 – a generally treeless prairie dominated by sagebrush, sunflowers, and prickly pear cactus. It does, however, retain remarkable intact tangible historic, namely archaeological, resources that include foundations of camp facilities, trees planted by former Amache internees, one of three surviving relocation center cemeteries and original dirt and gravel roads. These resources uniquely illustrate Amache’s historic layout and help explain what past Camp internees’ social and cultural interactions were once like. Amache is generally open to the public, but there are no developed areas accessible for further educational or interpretive visitor experiences other than a few roadside interpretive signs indicating the camp’s historic location and purpose. And though University of Denver and Granada High School students use the site for research, still no developed areas comprehensively exist for the purposes of site education, interpretation, and greater public benefit. In 2007 the Friends of Amache (which consists of the Amache Historical Society, the Amache Club, the Amache Preservation Society, and the Town of Granada) and the National Park Service organized a Comprehensive Interpretive Plan and Conceptual Development Plan outlining the interpretive and educational goals of the Amache site. One primary interpretive theme “from chaos to community” seeks to express the struggle of internees to develop a sense of community, maintain their family structure, and retain a sense of normalcy at Amache. An essential element to providing interpretation under this theme includes incorporation of building stock, in particular barracks buildings, currently missing from the site. The vast majority of Amache’s original building stock was dispersed through sale by the War Assets Administration in 1947, leaving only foundations to indicate the placement of buildings and expanse of the camp. Among the goals of the Plan is the creation of a more interactive, sensory visitor experience at Amache that can be provided by the physical presence of buildings on site grounds. An inventory of existing building stock related to Amache, including residential, administrative, institutional, and civic buildings, within the southeastern region of Colorado (including Baca, Bent, Crowley, Kiowa, Otero, Las Animas, and Prowers counties) and immediate areas of the adjoining states of Kansas and Oklahoma. A large percentage of Amache’s buildings were sold within the region. The survey includes future plans for the building block development based on Amache-related archival research, potential locations of building stock in the identified region covering a 110 mile radius of Amache, completed inventory forms of existing building stock at present locations including an evaluation of building stock physical and historic integrity, a moving feasibility study of buildings, and final report with recommendations on the future physical move of buildings, on-site stabilization, historic rehabilitation/restoration, interpretation, and potential related preservation funding sources. The Friends of Amache and partners wish to develop a barrack block or cluster of buildings on-site that would potentially include a mess hall, barrack building(s), guard tower, water tower, and a portion of camp fencing. Working in partnership with the Friends of Amache and the National Trust for Historic Preservation, Colorado Preservation, Inc. was awarded two grants from the National Park Service’s Japanese American Confinement Sites Grant Program in June 2010. Amache retains tangible historic resources that include foundations of camp facilities, yet no structures above the low foundations remain. This project will restore original historic fabric, the water tank and parts, found at a private ranch south of the Town, reconstruct the water tower and also an iconic guard tower using already developed construction documents following the Secretary of Interior Standards. The construction of the towers is a desired outcome identified in the 2007 Comprehensive Interpretive Plan and Conceptual Development Plan for Amache and is part of the greater goal to redevelop a barrack block on site. The water and guard towers will emphasize the confinement experienced by Amache internees, be interpreted for visitors, and draw heritage tourists. A rehabilitation and reconstruction plan for the Water Tower was completed in 2010, of which the original tank portion was found largely intact under ownership of the Fletcher family who owns a ranch 20 miles south of Granada. When the Fletchers donated the tank to the Amache Preservation Society in Feb. 2010, an architectural/structural engineering plan was developed to stabilize, move, and then store the tank for safe-keeping until further funds are raised to carry out the rehabilitation/reconstruction of the full water tower. In early Dec. 2010, while collecting the water tank materials from the Fletcher property (which was in use there since 1947), nearly all of the original water tower’s missing parts were discovered in a refuse pile not far from the tank site. The parts included the wooden “legs,” more than 300 fastening pieces like bolts and plates, and the original platform on which the water tower sat. These materials were thought to have been lost when the camp was abandoned in 1947, so you can imagine the surprise and delight of this discovery more than 60 years later! These parts will now be more accurately incorporated into the construction documents and design for the water tower reconstruction, which once complete will ultimately aid in visitor appreciation and understanding of Amache and the former internee experience. An interpretive panel design and fabrication is also included in the project. Alongside the guard and water towers project, CPI is helping to reconstruct a barrack on one of the original concrete foundations in a former residential block area at the southern end of the camp. To be located near the soon to be reconstructed guard and water towers, the barrack will serve as an important landmark and tool for interpretation of residential life at the camp. This project significantly contributes to the main interpretive goals outlined in the Conceptual Development Plan and Interpretive Plan, drafted in 2007. To round out the work begun with the current and previous projects, the goal of this project is to complete a package of interpretive materials for Amache to enhance the visitor experience and understanding of the site, including highlighting the soon-to-be-built water tower, guard tower and barrack. Included in the project are five wayfinding signs, an updated brochure, and better distribution for the already developed podcasts and driving tours. The laundry building will be placed near the site’s newly reconstructed guard and water towers and soon-to-be reconstructed barracks building. Also as a part of this project, we will develop plans for a future reconstruction of a mess hall, and will install lighting and security fencing for the guard and water towers. The work done at Amache would not have been possible without grant funding from the National Park Service (Japanese American Confinement Sites Grant Program), the Friends of Amache (which consists of Amache Historical Society, the Amache Club, the Amache Preservation Society, and the Town of Granada), the National Trust for Historic Preservation, and numerous private donations.